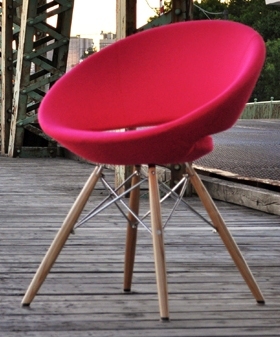 Soho Concept Crescent MW Dining Chair is a unique dining chair with a comfortable upholstered seat and backrest on a metal MW dowel base. Soho Concept reinterprets the mid-century furniture designs of the Case Study House program (1945-66) which was an exceptional, innovative event in the history of American architecture. The program's chief motivating force was Arts & Architecture editor John Entenza, a champion of modernism who had all the right connections to attract some of architecture's greatest talents, such as Richard Neutra, George Nelson, Charles Eames, and Eero Saarinen. 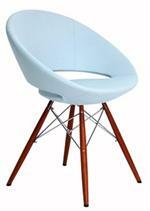 Crescent MW Chair seat has a steel structure with S shape springs for extra flexibility and strength. 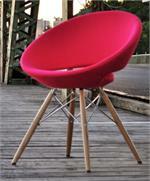 Crescent MW Dowel Chair seat is upholstered with a removable velcro enclosed leather, PPM or wool fabric slip cover. 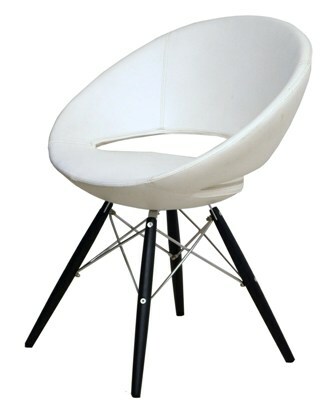 The Crescent MW Chair by Soho Concept chair is suitable for both residential and commercial use as a dining chair, restaurant chair, hospitality chair, lounge chair, lobby chair or side chair. H 29" W 22.5" D 24" Seat H 17"
Accurato is an authorized dealer of Soho Concept Chairs, Barstools, Tables, Sofas and all Soho Concept Furniture products. We carry the FULL line of Soho Concept offerings so call or email if you dont see what you are looking for.